Epic in scope, this multi-generation, globe-trotting saga covers not only the entire gamut of wine making, but wine's place in a treacherously globalized and hyper-marketed world. 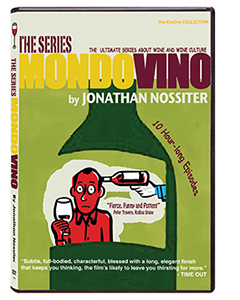 From the billionaire power brokers of Napa Valley, to the aristocratic rivalries of competing Florentine dynasties, to the efforts of three generations of a Burgundian family fighting to preserve their few acres of land, MONDOVINO: THE SERIES brings to life the human drama (and comedy) of wine making. Shot over several years and in five different languages, the series features numerous intimate encounters with the wine world's most iconic and controversial figures, including the critic Robert Parker, wine mogul Robert Mondavi, zany art collector Jan Schrem, and the noble proprietor of the mythical Romanee Conti vineyard. From Florence to Burgundy, New York to Argentina, each hour-long episode stands alone as a passionate and hilarious piece of documentary filmmaking.